There are many considerations in the placement of an emu chick. One must determine the environment in which it will live, and its intended work, so as to match the temperament of the bird to the life it will enjoy. And so, today we bid a fond farewell to two emu chicks who will go on to a particularly cushy lifestyle. 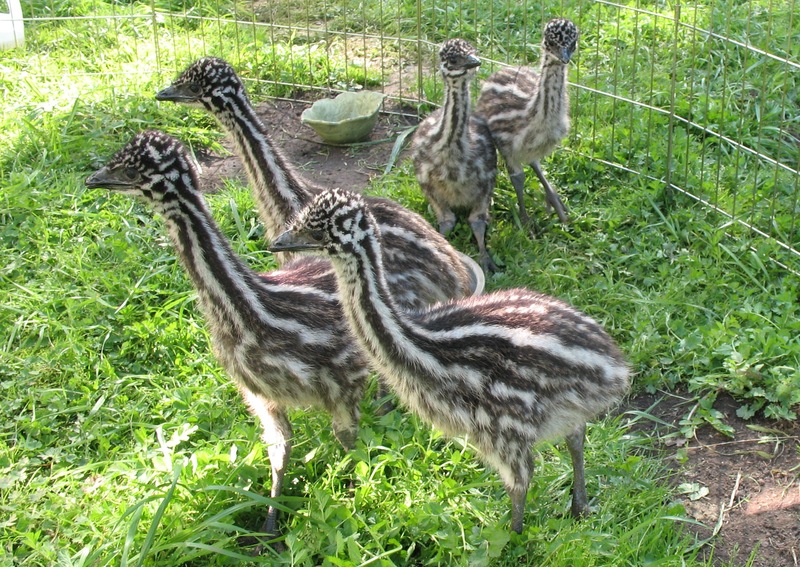 They will be The Royal Emus, who have actually gone off to live at a castle. It was a tough call to make. Not the suitability of the placement, but which chicks to send away—one of the emu emissaries was our favorite. We called him C3, because of the markings on his head. He was not only the youngest, but also the most independent of the lot. He was the one always ready to stir up fun, in a very emu way. When emus play, they drop to the ground, roll over while kicking, and then jump up in a frisky dance followed by running in circles like maniacs. If any of the other chicks is up for it, they’ll repeat the performance and the bunch of them will run around—smashing into one another like bumper cars. C3 was the main instigator of the high-jinks. He was also one of the most gentle of the bunch. He (she?) and the other youngest (whom we called Sleepy) seemed like the best personality matches for this particular gig. This sure beats the assignment for one of the other inquiries we received. They wanted to know if our emus could guard their sheep from mountain lions. They’ve apparently lost 24 goats, this year, to lions. (I’d say there’s a very healthy, and growing, lion family there.) We quickly hit the internet to find that emus are no match for lions. At best, they’d maybe slow the process as the lions worked their way through the emus, before moving on the other animals. But the words, “Tastes just like chicken,” kept ringing in my ears, so we enlightened them as to the facts of nature, and declined their offer. We’re now left with three. Elmer only wants two, but he says he’d keep three if the alternative meant having to send one off to a lonely life. (Of course, that’s easy for Elmer to say, he doesn’t have three emus in his bathroom!) Still, it made us feel better, because we felt the same way. We only want the best for our little emu chicks—even the ones who have gone off to a luxurious life of fame and fortune, leaving us peasants behind, to clean up after their three siblings. Funny thing is, we’ll probably visit.